Offering miles of pristine white-sand beaches, the family friendly CasaMagna Marriott Cancun Resort is located in the heart of the Cancun hotel zone. With its spectacular seafront location, the AAA Four Diamond resort presents spacious rooms with private balconies that feature captivating views of the turquoise waters of the Caribbean, Nichupte Lagoon, and beautifully manicured grounds. An organized Kids Club keeps the young ones busy, while adult guests enjoy water sports or relax in the full-service spa. Indulgent treatments include couple’s massage, facials, manicures, and pedicures. Interconnected with JW Marriott, CasaMagna Marriott Cancun Resort provides flexible indoor and outdoor meeting spaces. This magnificent family hotel in Cancun, located amidst the city’s hotel zone, welcomes visitors with a breathtaking beachfront location and all-inclusive offerings ideal for romantic weekend getaways, family vacations, and group events. A whirlwind of sporting activities are available, from volleyball to tennis to jet skiing, or guests can partake in workouts in the fitness center, which is graciously equipped with cardiovascular equipment, free weights, and separate men’s and women’s saunas. Water lovers can head to the surf to splash around, or stay on the resort’s grounds and swim in the outdoor pool and soak in the whirlpool; a children’s pool accommodates vacationing families. Meanwhile, sightseeing fun for the entire family is within close reach—landmarks include the Mayan ruins of Tulum, Isla Mujeres, Cozumel Island, and Aquaworld theme park. Accommodations at CasaMagna Marriott Cancun Resort allow guests to vacation in luxury. A majority of rooms, including two lavish presidential suites, feature lovely Caribbean Sea vistas; others provide views of the resort’s landscaped grounds or pool. Modern and convenient amenities comprise high-speed Internet and 32-inch LCD televisions, and every room boasts a private balcony. The renowned La Capilla Argentina is a unique Cancun steakhouse with cosmopolitan South American flair, serving international prime cuts, seafood dishes, and house specials. The all-American Champions Sports Bar highlights comfort foods in a casual setting, while Sasi Thai’s bold, flavorful meals aim to redefine Asian cuisine. Sushi connoisseurs will savor fresh offerings at Mikado Japanese Teppan Yaki, where dinner becomes a delightful fine dining show as the restaurant’s teppanyaki chefs cook at each table. 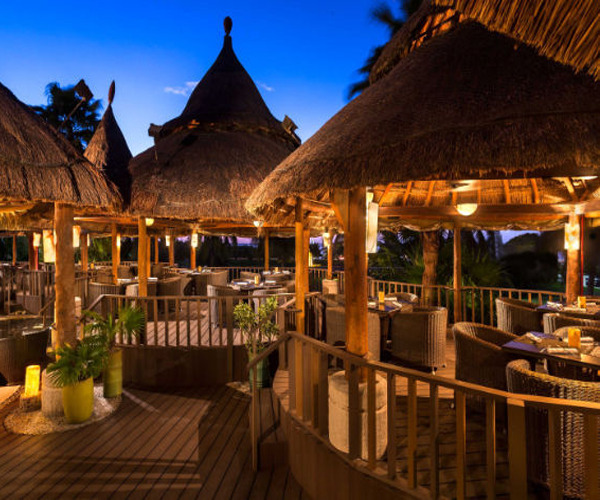 Other venues consist of the poolside La Isla grill and the beachside Bahia.